At LearningHerbs we love to love weeds. So many of those green pests that grow so easily and so abundantly are actually medicine chests in disguise. One of the first of these green allies to emerge from the snow or ground is a little star of a plant, chickweed (Stellaria media). A member of the pink family (Caryophyllaceae), its delicate stems and tiny white flowers sit unassumingly in garden beds and other disturbed soil areas. It spreads well (it is a weed!) and thrives in the cooler temperatures of spring and fall. If you’re wondering where chickweed gets its common name from, feed a plate of it to chickens and you’ll see them go bonkers for this nutritious feast. Energetically this plant is moistening and cooling (think of eating a slice of watermelon on a hot summer day and you’ll get the idea). It is often classified as a demulcent and refrigerant. Therefore, in herbalism we tend to use it for hot and dry conditions like inflamed tissues. It’s especially adept for external use such as a poultice, or made into an ointment or salve. Try it externally on rashes, pink eye, styes, diaper rash and other inflammatory skin conditions. It has a special affinity for bringing moisture to the mucous membranes, whether it is for soothing a hot and irritated urinary tract such as a bladder infection, or for relieving dry inflamed mucous membranes of the lungs that have resulted in a hot irritating cough. Chickweed isn’t just for medicine, however; this spring green is packed with nutrients. I learned from Paul Bergner that an Amish herbal treatment for increasing breast milk features our starry wonder. Chickweed’s flavor bursts of fresh spring goodness. A perfect food following the heavy and rich foods of winter. And luckily for us this is a nutritious, easy to grow and easy to harvest weed that tastes delicious! It makes a wonderful fresh salad, or can be gently steamed as a side dish. Just in case you have some picky eaters at home, this recipe shares a meal that is a slight twist on some good old comfort food. Okay, admittedly I did doll up this chickweed recipe a bit, calling for goat cheese and fancy olives, but I am sure you can easily adapt this recipe for your own version of grilled cheese. 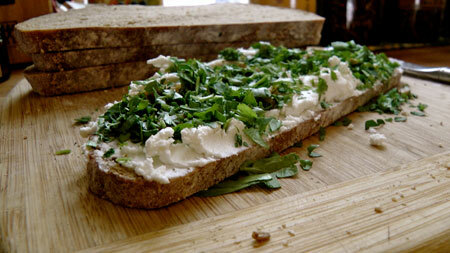 Begin by spreading the goat cheese on your sandwiches. Next mince your olives and sprinkle them over the cheese. Mince up the chickweed and cover the slice of bread well. Place the other slice of bread on top and cover it with a layer of butter. Warm up a cast iron pan (or whatever you use for grilling sandwiches). I like it to be sizzling hot when I put the sandwich on. Place the sandwich butter side down on to the pan. Grill until the bottom slice of bread has turned golden brown, taking care not to burn it. Spread a layer of butter on the top piece of bread. Flip the sandwich, turn to low heat, and cover. It’s done when both sides are golden brown and the cheese has been melted. Sometimes we spice this up a by adding minced garlic or a dash or two of cayenne pepper. However you choose to eat it, I hope you get your fill of chickweed this spring with this chickweed recipe. And remember to harvest this plant gently, keeping your eye out for fairies!